Herb of Venus, Herb of the Moon. Herb of love, Aphrodisiacal Herb, Magical Herb. Rose is associated with the Goddess of Love (Roman) Venus/ (Greek) Aphrodite. Roses have been used for thousands of years as medicine in cosmetics and of course as a perfume. It was the Iranian doctor, Avicenna, who is credited with the invention of the process for extracting rose water from rose petals in the early 11th century. The most highly regarded rose for it’s sent is Rosa damascena. It takes 5000kg fresh roses to make just 1kg of Rose Otto. Which is why this oil is so phenomenally expensive. Oil- Geraniol, nerol, citronello, geranic acid, eugenol, myrcene, B-phenethyl alcohol vitamin c, and many other constituents. Mild sedative, mild local anaesthetic, anti-inflammatory, astringent, Anti-depressive, Liver protector, aphrodisiac, cooling astringent, reduces cholesterol. Roses are cooling in nature and can therefore be used with all complaints where heat aggravates the condition. Roses may be used with good success for all red and itchy skin conditions. I have recently used a rose lotion with a patient who had a reaction to sunlight after a course of radiotherapy; the patient had very red, and very sore skin. I made a very simple cream using rose water, which I am told has helped the patient immensely. The rose family of plants is considered very safe by herbalists and can be used with children or the elderly with good success. The astringency of rose makes it a valuable herb in cases of diarrhoea and other fluid producing aliments, such as weeping skin, heavy menstruation, and leucorrhoea. An infusion of the flower petals has been used for centuries as an eye bath for red, watering and tired eyes. An ointment made out of fresh rose petals and anointed on the temples can bring relief to head aches, especially if caused by over heating. Another great use I have found for rose water is for my menopausal patients. I put the rose water in a spray mist bottle and tell them at the first sign of a “hot flush” to mist themselves with the rose water. It is instantly cooling and in some circumstances can reduce the “hot flush” immediately. Internally I use Rose fluidextract for those who have experienced emotional loss, grief, or heartache. It is also of help for those individuals who hold onto anger. Helping to “cool” the spirits and quell anger issues. Rose oil and rose extracts are fantastic for the skin, both young and mature. The mild astringent action helps with the appearance of wrinkles, while also toning the skin and evening out skin tone. Rose essential oil (Rose Otto) vibrates at the highest spiritual level - love. It is also an excellent herb when one is feeling low and depressed. It lifts the spirits and brings joy and happiness. The rose itself, is an ancient flower, fossils from the Tertiary era confirm that the rose was in existence and flourishing from that time onwards. In China during the Hang Dynasty there was such a fashion for rose gardens that the Emperor had to restrict its cultivation as it was starting to encroach onto agricultural land, threatening food production. Roses have a long history of being a symbol of love and passion, for these reasons roses have been employed in love potions and love phials for centuries. No love potion worth it’s salt would omit rose extract! The ancient Greek poetess, Sappho, crowned the rose the “Queen of all Flowers.” The word ‘rosa’ is derived from the Greek word ‘rodon’, meaning ‘red.’ The word ‘centifolia’ means ‘100 petals.’ The oldest known depiction of the rose is a fresco in a Crete palace called ‘Knossos”. It is believed that the fresco dates back to 2000 B.C. Clay tablet receipts recovered from Pylos (1500 B.C.) show the trade and purchase of rose oil. In alchemy, the rose symbolises divine or mystical love. Rose petals were scattered at ancient Roman and Egyptian weddings to ensure a happy marriage. Roses were a favourite of the Egyptians, who used rosewater as perfume and the petals as an air freshener. Roses became established in Egypt about the fourth century B.C., when the Persians invaded. It is said that the first century A.D. Egyptian Queen Cleopatra first made love to Mark Anthony on a carpet buried under 1 inch of rose petals. The Romans used roses extensively; the ancient Roman Emperor Nero was said to have slept on a bed of rose petals and he was also fond of carpets of rose petals. Hippocrates, the Greek father of western medicine, recommended steeping rose petals in oil as a remedy for diseases of the uterus. Ayurvedic physicians knew that rose petals were both cooling and astringent and so employed their use in poultices to treat wounds and skin inflammations. The Elizabethans used rose petals for their beauty and odour. They used rose to scent their food and their rooms with rose pot-pourri. Rose was also used to scent the laundry water. The women of the court during the reign of Queen Elizabeth the first sewed rose petals into their skirts in order to charm gallant courtiers. The Victorians gave red roses as a proclamation of their love and passion. - member of the National Institute of Medical Herbalists (MNIMH), has been practising as a full time herbalist since qualifying with a degree in Herbal Medicine in 2006. She is passionate about the healing properties of herbs and spreads the word through lectures, short courses, exhibitions, herbal walks and practical demonstrations. Wendy worked in a pharmacy setting for the last 5 years. 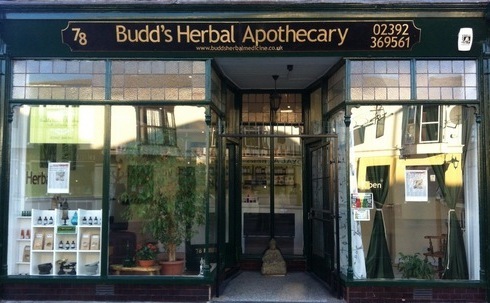 She now runs her own Herbal Apothecary in Southsea, Portsmouth, UK. *Nicholas Culpeper (1616 – 1654) was an English botanist, herbalist, physician, and astrologer. His published books include The English Physician (1652) and the Complete Herbal (1653), which contain a rich store of pharmaceutical and herbal knowledge.